Let the childer of the 20th Century swagger with their petty games and parlor tricks. The true power belongs to those who have seen centuries go past, not these spoiled brats. So take up the Mantle of Millennia. Show that you belong with the masters of the night, not the children..
Because if you're not ready someone else will be. 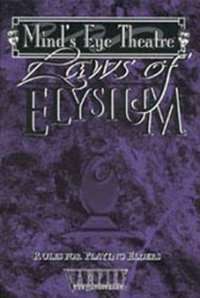 Laws of Elysium gives you everything you need to play an elder character in Mind's Eye Theatre. From tips on roleplaying to the new powers belonging only to the ancients to help for storytellers who want to integrate old and powerful characters into their games, Laws of Elysium has everything you need to make your chronicle... one for the ages.